Three weeks ago our companion blog from the USS Constitution Museum, Log Lines, shared a new discovery concerning the copper bolts used to construct “Old Ironsides.” Recently, a close inspection of two bolts removed from the ship in the 1992-1996 restoration revealed that the bolts were stamped “YS MINE CO.” Subsequent research showed that the stamp belonged to the Parys Mine Company of Greenfield Valley, Holywell, North Wales, (the “PAR” of the name “Parys” was missing from the stamp). This company had supplied at least some of Constitution’s copper bolts for her keel structure in the 1790s. Both bolts are 1 3/8 inch in diameter. One of the bolts (identified at bolt no. 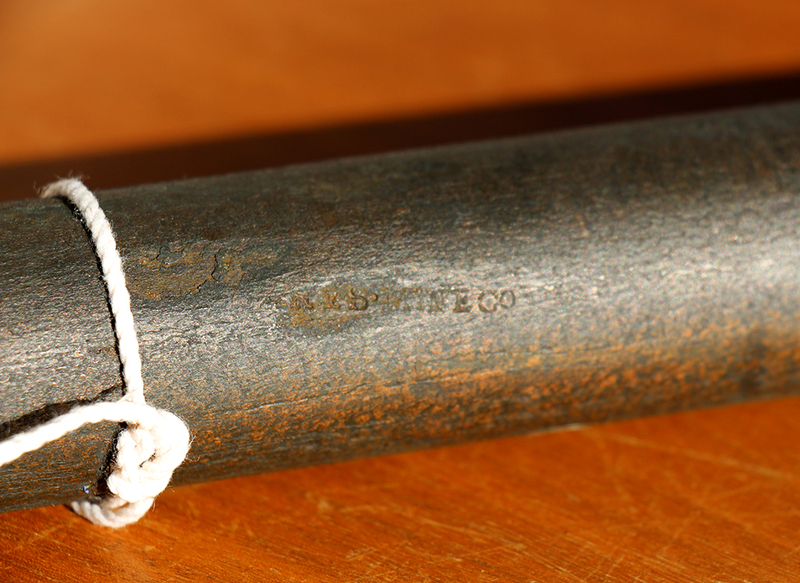 C82 by NHHC Detachment Boston, pictured above) today measures 56 1/2 inches long, or a little over 4 1/2 feet in length. Originally, it could have been more than 10 feet in length. It was removed from the keel structure about a third of the way aft between the fore and main masts. 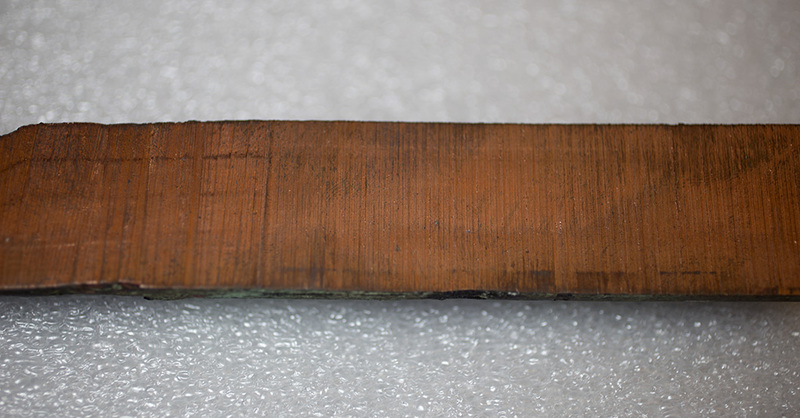 Sixty-five years later, in the 1992-1996 restoration, NHHC Detachment Boston used non-destructive testing and recording methods to document the condition of wood and copper fasteners in the oldest part of the ship. Constitution’s keel was x-rayed to determine if the copper bolts therein were in sound condition, partially sound condition, or very poor condition. The bolts in sound condition were left undisturbed, those in partially sound condition were reinforced with support from another bolt bored nearby, and the bolts in poor condition pulled and replaced. The x-rays saved time and effort and allowed the Detachment to leave more “original” material undisturbed in the ship’s keel structure. Until very recently, the story of “Old Ironsides'” copper bolts focused on Paul Revere with the mistaken belief that he had manufactured all of the ship’s copper fasteners. To test this theory, during the 1992-1996 restoration, NHHC Detachment Boston and MIT’s Center for Materials Research in Archaeology and Ethnology (CMRAE) established a proposal to “define a metallurgical signature with which to identify copper fasteners used on historic ships.”5 “Historic ships” is mentioned because the CMRAE study did include copper bolts from USS Constellation, HMS Victory and HMS Trincomalee. Based on the location of several bolts removed from Constitution‘s keel structure (including the two Parys Mine Company bolts) the Detachment Boston and CMRAE assumed those bolts were original and therefore had to have been manufactured by Revere. According to scientists at CMRAE in 1993, “The technical examination [would] include [a] determination of the metal or alloys from which the pins [were] made…”6 CMRAE’s premise hinged on the notion that copper bolts removed from Constitution could be “dated securely” and would exhibit distinct metallurgic characteristics. Several dozen copper bolts of varying diameters were removed from different parts of the ship, including the “worm shoe” (or false keel) on the bottom of the keel, the keel/keelson/deadwood, the forward edge of the cutwater, the transom (v-shaped beams that cross the stern post), and the garboard strake (the lowest exterior hull plank next to the keel). The test results showed that all of the bolts were made from nearly pure copper with little to no unique composition. Unfortunately, this neither confirmed nor denied that the keel bolts were made by Revere. Of the three copper bolts that were presumed to have been made by Revere based upon their size and location in Constitution‘s keel, two, in fact, were from the Parys Mine Company in Wales. This was confirmed by the stamps that were overlooked in the 1990s testing and discovered nearly a quarter of a century later. Indeed, all the bolts tested were compositionally identical regardless of whether they were manufactured in Great Britain or America. NHHC Detachment Boston shares in Lord’s goal and strives to preserve Constitution‘s “original” material. The Parys Mine Company revelation not only helps to increase our knowledge of Constitution‘s 1790s construction materials, but reminds us that, with each restoration, our understanding and interpretation of the ship continues to evolve. Who knows what discoveries are in store for the 2015-2017 restoration! [Lord, LT John A.] “U.S. Frigate CONSTITUTION (IX21) – Research Memorandum”, date stamped Nov. 27 1931, page 12. [Lord, John A.] “U.S.S. CONSTITUTION RESTORATION 1927-1930”, 49. Patrick Otton, Technical Writer, Naval History & Heritage Command Detachment Boston, 7 May 1993, Memorandum. Director, CMRAE/MIT – 1 June 1993, Memorandum.